Organic vs. Non-Organic Formula - I Am Proud Of My Kids! The number of formula choices available to parents can really be overwhelming. There are so many factors to consider when deciding what option is a great fit for your budget and your little one’s preferences. Even if you find an option that seems like a great choice, you may find that your child responds poorly to it and needs a change. The main thing to remember is that no decision is final. Consider the options and try something, but if it isn’t working you can always talk to a trusted friend, your pediatrician or other parents to get advice about other alternatives to try. One big decision you need to consider up front is whether you want to use organic or non-organic formula. While all formulas are required to meet the standards set by the Food and Drug Administration (FDA), there are differences between the added supplements and sugars found in formulas. Here, we’ve spelled out some specific differences between organic and non-organic formulas so that you can weigh your options appropriately. Although any formula, whether organic or not, is required to meet strict standards set by the FDA, every formula will contain slight differences in the recipe. In general, however, the formulas for babies of a certain age are all very similar from a nutritional standpoint. All formulas must have three basic components to their recipe: a fat source, a protein source and a carbohydrate sugar. The sugar is often a particular concern for parents, as some non-organic formulas contain corn syrup. However, even organic formulas will contain some sugar because it is required to aid in digestion. If there are no sugars, the formula wouldn’t be approved for the market. Here are some details about organic formula that you might want to consider when making a decision of which products to try. Farmers who supply ingredients for organic formula are not allowed to use any kind of genetic engineering in their growing practices. The cows whose milk is used must be given organic-certified feed and have no antibiotics or growth hormones. All crops that are used (both in the formula and to feed the animals for the product) have to be grown without chemical pesticides or herbicides. The farm from which the formula ingredients come has to pass a detailed inspection be a certified professional who ensures the guidelines are being followed. Organic formulas are considered a specialty product and therefore are often more expensive. Some organic formulas contain added cane sugar and brown rice syrup that reportedly taste sweeter than non-organic formulas. Brown rice syrup has been shown to contain naturally occurring arsenic in low levels so this should be something you research for each brand and product. Discuss your decision with a pediatrician who could advise you according to your child’s nutritional needs. 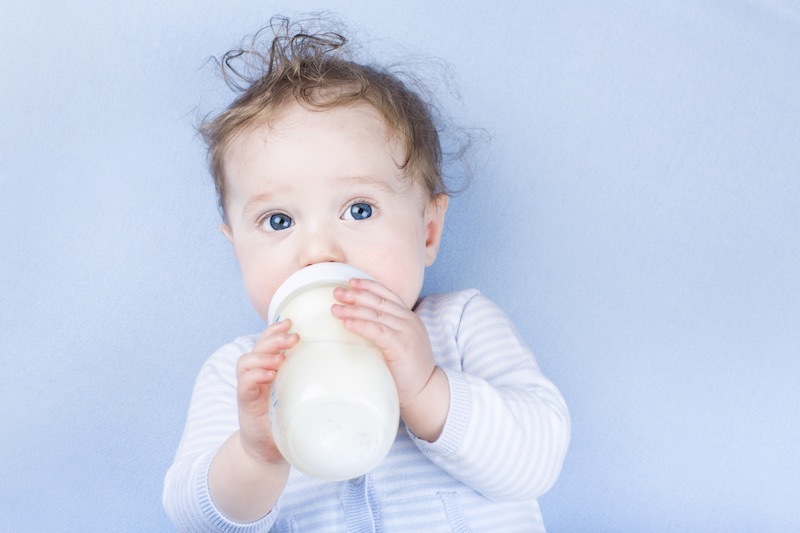 Make sure to read the list of ingredients for all formula varieties to ensure that there aren’t any additives that could potentially harm your baby. Be willing to make a change if you see that the formula you have chosen isn’t the best option for your baby. Remember that every formula must go through the same rigorous testing process by the FDA before they can be marketed and sold. Because of this quality control process, all formulas are deemed safe and healthy for your child. Your decision to purchase organic vs. non-organic formula is more a personal lifestyle and preference than anything. Talk to a pediatrician or professional if you have questions or concerns for your child’s specific needs. Be the first to comment on "Organic vs. Non-Organic Formula"